The air is soft and light, like a cashmere sweater, just warm enough to be comfortable. The birds are singing, the garden is turning green and weeds are popping up like - well, weeds. And our world is awash in purple. Warm spring days like these stir up the fondest memories of when I was a girl. My grandmother would fill her house with fresh cut flowers from the garden. She couldn't get enough. A kaleidoscope of flowers in every room, eclectically arranged in old jam jars and chipped tea cups. Lilacs, irises, tulips, cherry blossoms, and wild flowers which I'd gathered from the hills behind her house. On May Day she would help me weave them into a crown to pin in my hair. Throughout the summer months the sweetest, most intoxicating aroma would waft through her rooms, carried on the gentle breeze which rustled her embroidered curtains. When she died and the house was sold, I transplanted some of her lilac bushes into my own garden. 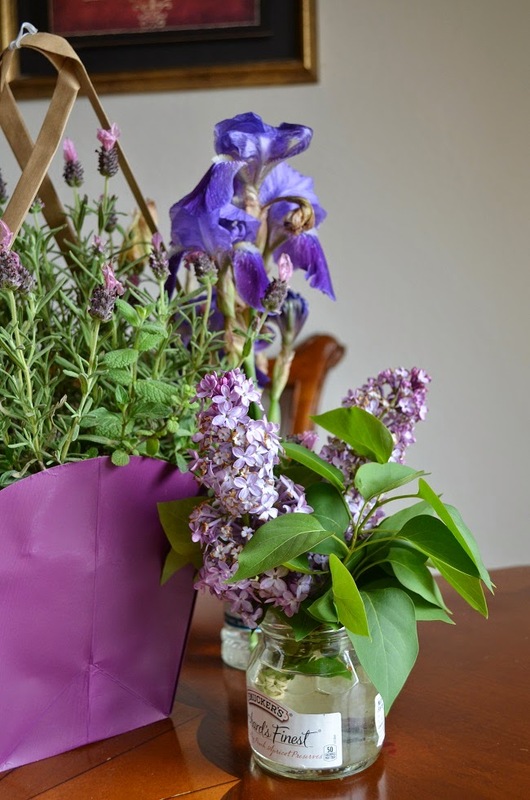 These days, her lilacs grace my kitchen table. On warm spring days like these, I throw open the windows and doors, and let the dog come and go as she pleases. You have no idea how happy this makes her. She bounds in and out, relishing the new-found sense of freedom. Finally she settles in the sunbeam that stretches through the open door and across the kitchen floor, only to pounce back out if a squirrel or bird ventures too close. I love the sense of openness in the house, too. The sun is brighter, the air is fresher and smells of rain and, like my grandmother's house, my rooms are dressed in royal shades of purple - irises, lilacs, lavender, and chive blossoms, all in bloom right now. 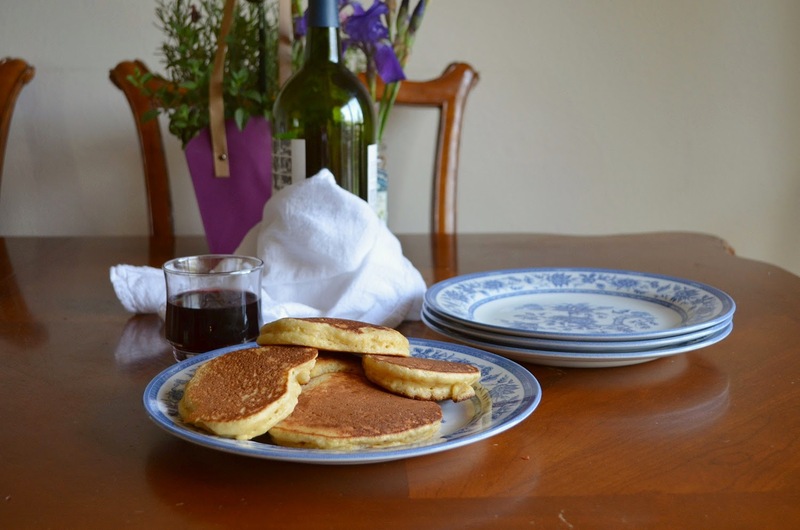 These cornmeal pancakes are delicately laced with cinnamon, but are thick and hearty enough for dinner. Don't adulterate them with table syrup. 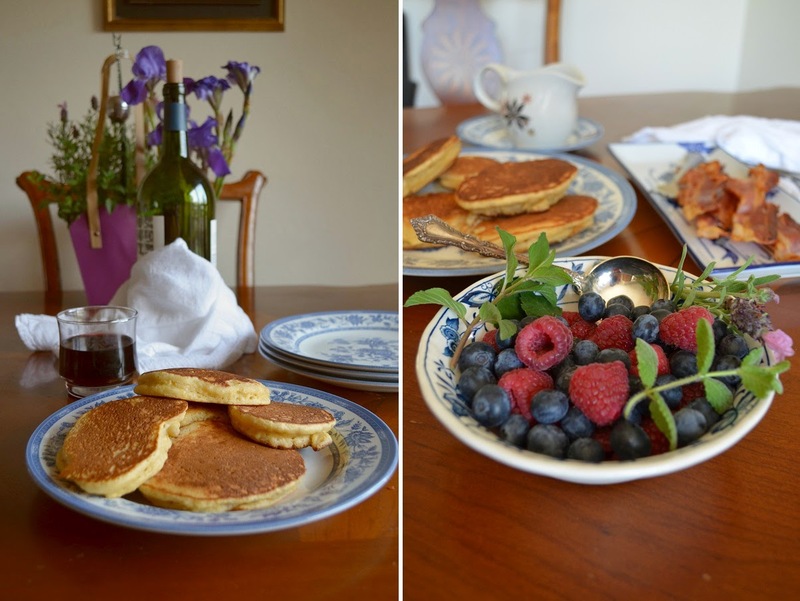 They deserve real maple syrup, the finest salted butter and fresh berries garnished with herbs from the garden. Mint, basil or lavender all go well. And, if you're making them for dinner, serve with a crisp white wine or a light Merlot. Pancakes, berries, and wine for dinner make me very happy, too. Like grandmother, like mother, like daughter. Preheat a griddle or large skillet over med. heat. In a large bowl, mix the flour, cornmeal, sugar, baking powder, salt, and cinnamon. In a medium bowl melt the butter. Whisk in the milk, eggs, honey, and vanilla. Stir the wet ingredients into the dry, and mixed until well combined. Oil the griddle with a little butter and use a ladle to drop the batter into the pan. Cook over med-low heat until golden and tiny bubbles begin to form around the edges. Carefully flip and cook on the other side until golden. Watch these carefully so they don't burn. If they're browning too quickly, turn the heat to low. 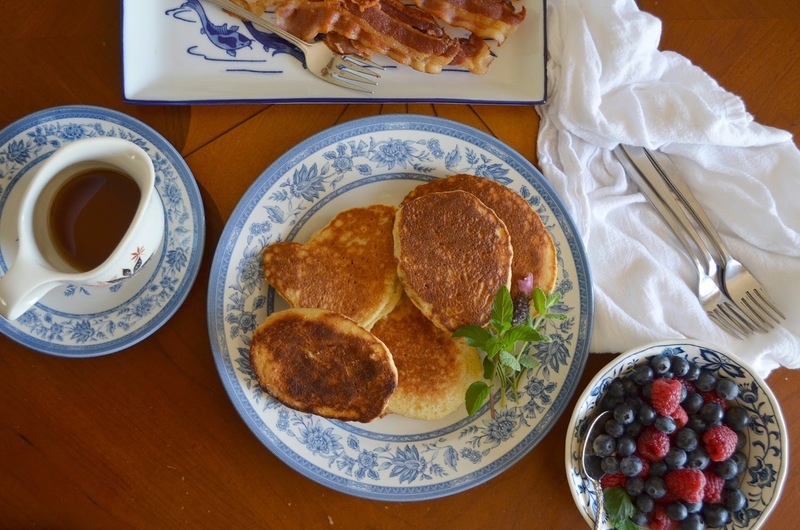 Remove the pancakes to a large platter that's being kept warm in the oven. Repeat with the remaining batter, buttering the griddle each time. 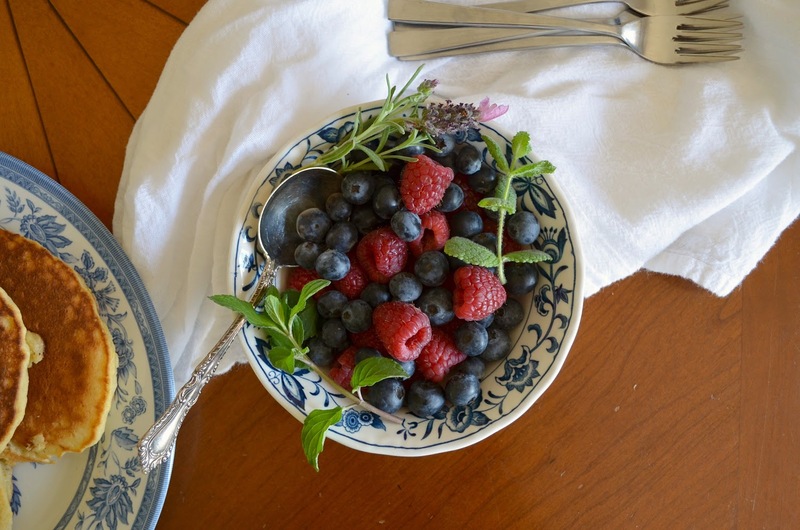 Serve with butter, warmed maple syrup, fresh berries and sweet herbs.